San Marcos, TX - Last night Mayor Susan Nervais made good on a promise to overturn the mandatory pet chipping city ordinance in San Marcos. After several meetings with CETI, an anti-animal chipping group based in Central Texas, Nervais was joined in support of her decision to overturn by two other councilmembers during last nights City Council meeting. Lisa Cappoletta of CETI, after organizing a potent coalition of anti-RFID groups in the area, turned up at the meeting to Collect on Delivery of Mayor Nervais' promise. Approximately 100 protestors equipped with colorful signs, sang songs, chanted and cheered in favor of the decision. San Marcos struggle with the chipping mandate recruited efforts of National consumer privacy expert, Katherine Albrecht from Boston, MA. To Lisa Cappoletta, Judith McGeary, Ms. Albrecht and the workers against the animal RFID experiments on the taxpayer's dime, we here at BeatTheChip solute you. The spy shop that brought you the Bush administration's warrantless wiretapping program wants to expand its power under President Barack Obama, the nation's top intelligence chief told Congress Wednesday, in a little-noticed intelligence grab. "Look, you cannot build a fence from San Diego to Brownsville, Texas, and call that an immigration policy." - Janet Napolitano on NPR. We are so "haters" on any part of the Real ID Act, including the ineptitude of a border wall fence. To the admission of Minutemen border watchers, the fence only keeps out 11% of those who intend to cross. Our translation: the border wall fence keeps out the handicapped. Thus, pounds nails into the coffin of the very dead argument that Duncan Hunter's border fence WORKS. You cannot argue with Janet on this. She governed in a state where people die every year in extreme desert conditions to enter this country. She knows a simpleminded fence vs. desperate people will lose the battle. We don't need the Real ID Act to enforce immigration in Texas or anywhere else in the U.S. It's time to face the Elephant in the living room. Ask yourselves why the U.S. has maintained policy of NOT enforcing it's immigration and then overlegislating around the issue and co-opting the immigration debacle as argument to muddy the political waters. One such case would be the case with getting too attached to the Real ID Act's rubber crutch immigration policy. They can build the fence and then NOT enforce the Amnesty clause just like they maintain policy of NOT enforcing current immigration laws. Looks like we are left holding Le Bag with a new handy dandy big brother license as a reward. How does that make you feel? If you can let go of the LEAST effective plan for immigration policy you can start dealing with the beefier issues: employment, labor and what real enforcement of immigration law will look like. However, that is not our chief concern. Our concern is our American Identity. Don't make immigration the licenseholders problem. Napolitano is not out of the woods with us by any stretch. Her cattle call to the tech trough for RFID Enhanced Drivers licenses seeks to kick us back to square one. 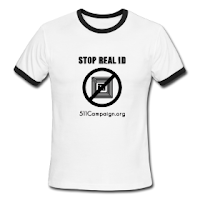 Our biggest hurdle yet, past Napolitano & DHS, are people who believe that Real ID's immigration policy is needed. We have all the law and immigration policy we need- we just don't enforce it. Again - don't make it the licenseholder's problem. We do not need biometrified licenses with Western Hemisphere Travel Initiative gridding so the tech contractors can sleep in comfort at night while our physical attributes are sifted by narcissists like it's their Intellectual Property. That is not what America is about. We draw the line. We don't run our country like the Eastern block of Europe circa 1940. It's time to remind our leaders of America's real identity. The plan to catalogue you, sift and create a product identity for you is not your idea. It's not an American idea. It's a globalist idea. Please don't concede to a place in your conciousness where you believe the policy generators who put Real ID in place aren't looking for a way to save it. 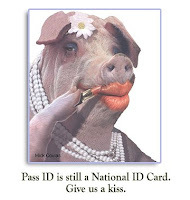 Napolitano's re-branding of Real ID as Enhanced Drivers Licenses is an attempt to save it. You must resolve that this is not your life BEFORE there is an RFID reader on every shopping center corner in your neighborhood. 8:30 PM - SPYCHIPS Book signing with Author K. Albrecht. 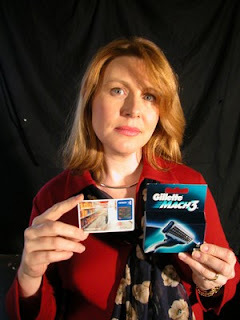 Judith McGeary: Farm & Ranch Freedom Alliance - An attorney and advocate against the use of microchipping mandated for farm animals. She and her husband also run a small organic farm, with horses, cow, sheep, and poultry, based on the principles of holistic resource management. Lisa Cappoletta: CETI, San Marcos - Leader in the fight to restore sanity to animal indentification without the mandatory use of microchip technologies in pets in the City of San Marcos, TX. BTC -Continued news from privacy expert, Katherine Albrecht about Napolitano's re-branding of Real ID.